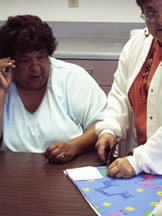 TONKAWA Talking Leaf notes: Meeting of April 10, 2005. Sometimes you just cannot pass up a yard sale. Especially if it is just across the street from the TONKAWA gathering. Some of the members zipped over and back as we were setting up the room for the gathering. TONKAWA President Esther Abrahano joined hands in a prayer circle for all our Indian Nations peoples. She completed the prayer in her Choctaw language. Good fellowship is all around us as the members enter the room greet and as they find their seats they form into favorite or new conversation groups. Announcements of the Native American events downtown and the California Indian Education Conference at the Town and Country Hotel are brought to the TONKAWA members attention. 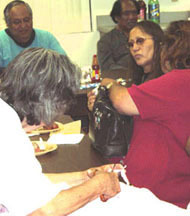 The news that later this Sunday, April 10, 2005 salmon and buffalo are being served at the downtown gaming conference brings smiles to the TONKAWA membership. Very tasty grilled or boiled Hebrew National frankfurters, German sauerkraut, all sorts of stimulating condiments to dress up the hot dogs and beans. Chips, potatoes and corn or egg bread buns round out our carbohydrate body parts. This is real picnic fare to set the mood for our upcoming Annual TONKAWA picnic. Tasty fruits, Ambrosia, and 'Vitamin D', donuts spin up the sugar meters. Choices of hot coffee and soda pop to wash the sugar down with. Great fun, traditional tribal teasing and good fellowship makes this one of the most satisfying events of the month. Jean Vigneault brought in fleece material for the blanket craft activities. Tables were cleared and projects were laid out. Those participating and observing are eager to voice opinions and suggestions, it is all good. All members and visitors left with thoughtful opinions, big smiles and memories of a different meeting and some with a nice gift and snack for later too! Members will attempt to get together and continue discussing: site, date, transportation coordination and fun activities for the Annual TONKAWA picnic at the Balboa Park Indian Culture days on May 14 & 15, 2005- noon to dusk. Maybe we will see you and a friend at the next TONKAWA meetings at the Many Nations: Chet Hunt Community room, 3928 Illinois St. San Diego, CA.